In a multi-cloud world, it’s harder than ever to strike that balance between ensuring that data can travel along the many avenues of your network and making sure that your network and all of its assets stay secure. This white paper examines 128T’s Session Smart Routers and how they’re designed to deploy security, segmentation, and load balancing for traffic across different cloud platforms, both public and private. 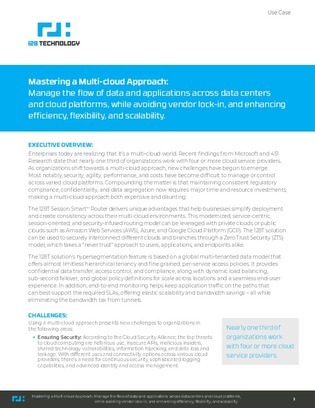 Find out how you can operate more efficiently in hybrid and multi-cloud environments by improving network security without hampering app performance.